Although the State of California is leading the charge on this lawsuit, it should be noted that this Petition does not address California’s ability to seek a waiver of the EPA’s tailpipe standards (otherwise known as “CAFE” standards) under the Clean Air Act. This is a pre-emptive move to establish that the entire roll-back of the standards is arbitrary and capricious and not in accordance with law. The California Office of the Attorney General recently published the its summary of all reported Proposition 65 settlements for 2017. According to the Executive Summary (http://bit.ly/2HtC2Mg) in 2017 there were 688 Proposition 65 settlements reported to Attorney General. A total of $25,767,500 were paid by alleged violators, with a whopping $19,486,362 being paid to attorneys for their fees and costs. That represents 76% of the total going to attorneys rather than to the “plaintiffs” in Prop 65 cases. For example, the “Consumer Advocacy Group,” which is represented exclusively by the law firm of Yeroushalmi & Yeroushalmi had 30 settlements last year, amounting to $3,106,750 in payments. Of that $3,106,750, $2,640495 of it, or 85% went to the Yeroushalmi firm. The Brodsky & Smith firm, which represented a handful of putative plaintiffs, reported 115 settlements in 2017 for a grand total of $1,888,000 or which $1,727,050, or 91% went to pay attorneys fees and costs. The Chanler Group also represented several putative plaintiffs. In 2017, they had 147 settlements, for a total of $3,978,700, of which $3,356,125, or 84%, went to pay attorneys fees and costs. 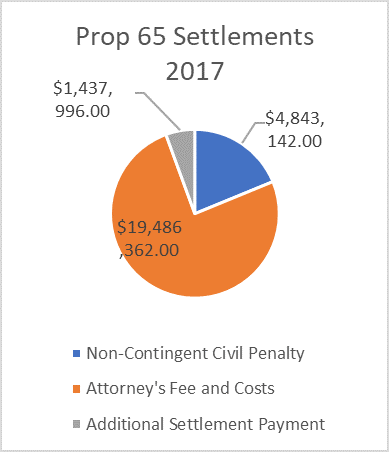 These lawsuits are supposedly undertaken by “private enforcers” in the public interest, but it is hard to imagine that the public interest is served when over three-quarters of the “settlement” amounts are going straight into the law firms’ back-pockets. EPA Sued by 4 States Over SO2 Designations. IPCC Says It Is 95% Likely that humans cause climate change. DOJ Sues Dallas-based Luminant, Alleges Coal Burning Power Plants Did Not Have Permits. Energy Firms, Including Chevron, Sued in Louisiana Federal Court Over Oilfield Waste Disposal. 3rd Circuit Holds That State Tort Claims Not Pre-Empted by Federal Clean Air Act. DC Circuit upholds EPA’s authority to set air emission standards for sewage sludge incinerators. 3rd Circuit Decides EPA’s Attempt To Get Homer Generating Plant to Comply with PSD Requirements Is Too Late. AK Steel Agrees to $1.65 Million Civil Penalty to Resolve Clean Air Act Violations. OK Attorney General Says He Will Seek En Banc Hearing on EPA Haze Rules Ruling. In July, the 10th Circuit ruled that EPA has the authority to implement its own plan to limit sulfur dioxide emissions as part of the regional haze rule. Oklahoma Gas & Electric has sued the EPA alleging that the EPA rule more stringent than the state’s proposed rule and that implementing those rules would usurp state authority. OK Attorney General Scott Pruitt stated that he will seek an En Banc hearing of the three judge panel’s ruling. http://bit.ly/13WyDqc. En Banc hearings are rarely granted, but the split (2-1) decision of the 3-judge panel makes another review more likely. Approval and Promulgation of Gila River Indian Community’s Tribal Implementation Plan [EPA-R09-OAR-2007-0296, FRL-9259-9]. SUMMARY: EPA is approving a Tribal implementation plan (TIP) submitted by the Gila River Indian Community (GRIC or Tribe) on February 21, 2007, as supplemented and amended on July 11, 2007, June 22, 2009, and July 17, 2010, and as described in our August 12, 2010 proposal. The TIP includes general and emergency authorities, ambient air quality standards, permitting requirements for minor sources of air pollution, enforcement authorities, procedures for administrative appeals and judicial review in Tribal court, requirements for area sources of fugitive dust and fugitive particulate matter, general prohibitory rules, and source category-specific emission limitations and standards. These provisions establish a base TIP that is suitable for the GRIC’s reservation and regulatory capacities and that meets all applicable minimum requirements of the Clean Air Act (CAA or Act) and EPA regulations. The effect of this action is to make the approved portions of the GRIC TIP federally enforceable under the CAA and to further protect air quality within the exterior boundaries of the GRIC reservation. Protocol Gas Verification Program and Minimum Competency Requirements for Air Emission Testing; Final Rule [EPA-HQ-OAR-2009-0837; FRL-9280-9]. SUMMARY: EPA is finalizing rule revisions that modify existing requirements for sources affected by the federally administered emission trading programs including the NOX Budget Trading Program, the Acid Rain Program, and the Clean Air Interstate Rule. EPA is amending its Protocol Gas Verification Program (PGVP) and the minimum competency requirements for air emission testing (formerly air emission testing body requirements) to improve the accuracy of emissions data. EPA is also amending other sections of the Acid Rain Program continuous emission monitoring system regulations by adding and clarifying certain recordkeeping and reporting requirements, removing the provisions pertaining to mercury monitoring and reporting, removing certain requirements associated with a class-approved alternative monitoring system, disallowing the use of a particular quality assurance option in EPA Reference Method 7E, adding two incorporation by references that were inadvertently left out of the January 24, 2008 final rule, adding two new definitions, revising certain compliance dates, and clarifying the language and applicability of certain provisions. Draft Integrated Science Assessment for Ozone and Related Photochemical Oxidants [FRL-9286-7; Docket ID No. EPA-HQ-ORD-2011-0050]. SUMMARY: EPA is announcing an extension of the public comment period for the first external review draft of a document titled, “First External Review Draft Integrated Science Assessment for Ozone and Related Photochemical Oxidants” (EPA/600/R-10/076A). The original Federal Register notice announcing the public comment period was published on February 28, 2011 (76 FR 10893). This assessment document was developed by the National Center for Environmental Assessment (NCEA) within EPA’s Office of Research and Development as part of the review of the national ambient air quality standards (NAAQS) for ozone. Science Advisory Board Staff Office; Notification of a Public Meeting of the Advisory Council on Clean Air Compliance Analysis Augmented for Review of the Report to Congress on Black Carbon. [FRL- 9287-2]. SUMMARY: The Environmental Protection Agency (EPA or Agency) Science Advisory Board (SAB) Staff Office announces a public face-to-face meeting of the Black Carbon Review Panel. DATES: The meeting will be held on April 18, 2011 from 9 a.m. to 5 p.m. and April 19, 2011 from 8:30 a.m. to 2:30 p.m. (Eastern Time). ADDRESSES: The Panel meeting will be held at the Omni Shoreham, 2500 Calvert Street NW., Washington, DC 20008. Human Studies Review Board (HSRB); Notification of a Public Meeting [EPA-HQ-ORD-2011-0124; FRL-9287-1]. SUMMARY: The U.S. Environmental Protection Agency (EPA) Office of the Science Advisor (OSA) announces a public meeting of the HSRB to advise the Agency on EPA’s scientific and ethical reviews of research with human subjects. DATES: This public meeting will be held on April 13-14, 2011, from approximately 8:30 a.m. to approximately 5 p.m. Eastern Time. With climate change legislation held up in U.S. Congress, the eyes of the nation have focused on the states, particularly on California, which passed a landmark climate change law, the Global Warming Solutions Act of 2006, known as AB32. Former Governor Schwarzenegger called the law one of his greatest achievement of his administration. However, in a tentative ruling issued last month, San Francisco Superior Court Judge Ernest Goldsmith ruled that state air quality regulators must conduct further analysis before fully implementing AB32. The lawsuit, brought by The Center on Race, Poverty and the Environment alleged that the California Air Resources Board (CARB) had violated state environmental law by failing to properly study alternatives to plans it has adopted. Judge Goldsmith’s opinion states that the CARB approved the larger plan to implement AB32 prior to completing the required environmental review under the California Environmental Quality Act (CEQA). Although the decision, should Judge Goldsmith make it his final ruling, will delay implementation of AB32, the lawsuit was brought not by those opposed to AB32, but by parties who support AB32. Indeed, the plaintiffs have backed AB32 and have helped defend it against Proposition 23, last November. While many right-wing, anti-environment pundits have proclaimed this ruling as a victory for climate deniers (see e.g., this blog post), a careful reading of the opinion indicates that this provides a opening for a much broader reading of AB32. Cap-and-trade, as has been pointed out in this blog previously, was a compromise developed to bring market mechanisms to acid rain regulations. It was meant to replace “command and control” regulations. Here, the plaintiffs may seek to move away from cap-and-trade and other market based mechanisms and back to a more command-and-control type system. In any case, should the ruling become permanent, it will be interesting to see what the CARB does: will it appeal? Will it seek a stay so that it can proceed with implementation pending appeal? Or will it simply throw in the towel and go back to the CEQA drawing board? Environmental Impact Statements; Notice of Availability. [ER–FRL–8993–3]. Responsible Agency: Office of Federal Activities, General Information (202) 564–1399 or http://www.epa.gov/ compliance/nepa/. Weekly receipt of Environmental Impact Statements Filed 10/11/2010 Through 10/15/2010 Pursuant to 40 CFR 1506.9. Notice of Receipt of Several Pesticide Petitions Filed for Residues of Pesticide Chemicals in or on Various Commodities. [EPA–HQ–OPP–2010–0012; FRL–8851–1]. SUMMARY: This notice announces the Agency’s receipt of several initial filings of pesticide petitions proposing the establishment or modification of regulations for residues of pesticide chemicals in or on various commodities. DATES: Comments must be received on or before November 22, 2010. Proposed Administrative Settlement Agreement Under Section 122 of the Comprehensive Environmental Response, Compensation, and Liability Act for the Crown Vantage Landfill Superfund Site Located in Alexandria Township, Hunterdon County, NJ. [FRL–9216–7]. SUMMARY: The United States Environmental Protection Agency (‘‘EPA’’) is proposing to enter into an administrative settlement agreement (‘‘Settlement Agreement’’) with Georgia- Pacific Consumer Products, LP and International Paper Company (collectively ‘‘Settling Parties’’) pursuant to Section 122 of the Comprehensive Environmental Response, Compensation, and Liability Act (‘‘CERCLA’’), 42 U.S.C. 9622. The Settlement Agreement provides for Settling Parties’ payment of certain response costs incurred by EPA at the Crown Vantage Landfill Superfund Site located in Alexandria Township, Hunterdon County, New Jersey. In accordance with Section 122(i) of CERCLA, 42 U.S.C. 9622(i), this notice is being published to inform the public of the proposed Settlement Agreement and of the opportunity to comment. or thirty (30) days following the date of publication of this notice, EPA will receive written comments relating to the proposed Settlement Agreement. EPA will consider all comments received and may modify or withdraw its consent to the settlement if comments received disclose facts or considerations that indicate that the proposed settlement is inappropriate, improper or inadequate. EPA’s response to any comments received will be available for public inspection at EPA Region 2, 290 Broadway, 17th floor, New York, New York 10007–1866. DATES: Comments must be provided by November 22, 2010. Approval and Promulgation of Air Quality Implementation Plans; Rhode Island; Determination of Attainment of the 1997 Ozone Standard for the Providence, RI Area. 40 CFR Part 52 [EPA–R01–OAR–2010–0459; A–1–FRL– 9215–9] . SUMMARY: The EPA is determining that the Providence (All of Rhode Island) moderate 1997 8-hour ozone nonattainment area has attained the 1997 8-hour National Ambient Air Quality Standard (NAAQS) for ozone. This determination is based upon complete, quality-assured, certified ambient air monitoring data that show the area has monitored attainment of the 1997 8-hour ozone NAAQS for the 2007–2009 monitoring period. Preliminary data available to date for the 2010 ozone season is consistent with continued attainment. Under the provisions of EPA’s ozone implementation rule, the requirements for this area to submit an attainment demonstration, a reasonable further progress plan, contingency measures, and other planning State Implementation Plans related to attainment of the 1997 8-hour ozone NAAQS shall be suspended for so long as the area continues to attain the 1997 ozone NAAQS. In addition, EPA is determining that this area has attained the 1997 ozone NAAQS as of June 15, 2010, its applicable attainment date. Approval and Promulgation of Implementation Plans; Illinois; Voluntary Nitrogen Oxides Controls. 40 CFR Part 52 [EPA–R05–OAR–2007–1096; FRL–9215–8] . SUMMARY: On May 1, 2001, the Illinois Environmental Protection Agency (Illinois EPA) submitted a request for EPA approval of a State Implementation Plan (SIP) revision for regulations governing Nitrogen Oxides (NOX) emission allowances granted for implementation of voluntary control of NOX emissions from sources other than those covered by other Illinois NOX emission control regulations. On March 4, 2008, EPA proposed to disapprove the requested SIP revision. This final rule completes the disapproval of the requested SIP revision. Approval and Promulgation of Implementation Plans; State of Missouri. 40 CFR Part 52 [EPA–R07–OAR–2010–0415; FRL–9210–3] . SUMMARY: EPA is approving a revision to a State Implementation Plan (SIP) submitted by the State of Missouri. The purpose of this revision is to update the Springfield City Code and is part of ongoing SIP maintenance to assure that outdated local codes and ordinances do not remain in the SIP. The revision reflects updates to the Missouri statewide rules, and will ensure consistency between the applicable local agency rules and the Federally approved rules. Approval and Promulgation of Implementation Plans; State of Missouri. 40 CFR Part 52 [EPA–R07–OAR–2010–0415; FRL–9210–2] . SUMMARY: EPA is proposing to approve a revision to a State Implementation Plan (SIP) submitted by the state of Missouri. The purpose of this revision is to update the Springfield City Code and is part of ongoing SIP maintenance to assure that outdated local codes and ordinances do not remain in the SIP. The revision reflects updates to the Missouri statewide rules, and will ensure consistency between the applicable local agency rules and the Federally approved rules. Notice of Data Availability on Coal Combustion Residual Surface Impoundments. 40 CFR Parts 257, 261, 264, 265, 268, 271, and 302 [EPA–HQ–RCRA–2009–0640; FRL–9216–3] RIN 2050–AE81. SUMMARY: This document announces the availability of new information and data posted in the docket for EPA’s proposed rulemaking (75 FR 51434, August 20, 2010) on the Disposal of Coal Combustion Residuals from Electric Utilities. The Agency is seeking public comment on how, if at all, this additional information should affect the Agency’s decisions as it develops a final rule. The information has been posted on EPA’s Web site, and is now currently available in the docket; it consists of responses to Information Collection Requests that EPA sent to electric utilities on their coal combustion residual surface impoundments as well as reports and materials related to the site assessments EPA has conducted on a subset of these impoundments. received on or before December 6, 2010. Under the Paperwork Reduction Act, comments on the information collection provisions are best assured of having full effect if the Office of Management and Budget (OMB) receives copy of your comments on or before November 22, 2010. Public Hearing. We will hold a public hearing on November 5, 2010. Persons requesting to speak at the public hearing must contact EPA by November 1, 2010. National Priorities List, Proposed Rule No. 53. 40 CFR Part 300 [EPA–HQ–SFUND–2010–0634, EPA–HQ– SFUND–2010–0636, EPA–HQ–SFUND–2010– 0638, EPA–HQ–SFUND–2010–0639, EPA– HQ–SFUND–2010–0640, EPA–HQ–SFUND– 2010–0641, EPA–HQ– SFUND–2010–0643, EPA–HQ–SFUND–2010–0645, EPA–HQ– SFUND–2010–0646, EPA–HQ–SFUND–2010– 0647; FRL–9216–1] RIN 2050–AD75. SUMMARY: The Comprehensive Environmental Response, Compensation, and Liability Act (‘‘CERCLA’’ or ‘‘the Act’’), as amended, requires that the National Oil and Hazardous Substances Pollution Contingency Plan (‘‘NCP’’) include a list of national priorities among the known releases or threatened releases of hazardous substances, pollutants, or contaminants throughout the United States. The National Priorities List (‘‘NPL’’) constitutes this list. The NPL is intended primarily to guide the Environmental Protection Agency (‘‘EPA’’ or ‘‘the Agency’’) in determining which sites warrant further investigation. These further investigations will allow EPA to assess the nature and extent of public health and environmental risks associated with the site and to determine what CERCLA financed remedial action(s), if any, may be appropriate. This rule proposes to add nine sites to the General Superfund section of the NPL. This rule also withdraws one site from proposal to the General Superfund section of the NPL. DATES: Comments regarding any of these proposed listings must be submitted (postmarked) n or before December 20, 2010. Access in Litigation to Confidential Business Information. [FRL–9216–6]. SUMMARY: The EPA has authorized the United States Department of Justice (‘‘DOJ’’) to disclose, in response to discovery requests received in the litigation styled, Tronox Incorporated, et al., v. Anadarko Petroleum Corp., et al., Adv. Proc. No. 09–01198 (ALG), pending in the United States Bankruptcy Court for the Southern District of New York (the ‘‘Litigation’’), information which has been submitted to EPA by its contractors that is claimed to be, or has been determined to e, confidential business information (‘‘CBI’’). The EPA is providing notice of past disclosure and of ongoing and contemplated future disclosure. Interested persons may submit comments on this Notice to the address noted below. DATES: Access by the DOJ and/or the parties to the Litigation to material discussed in this Notice that has been either claimed or determined to be CBI is ongoing, and is expected to continue in the future during he pendency of the Litigation. The EPA will accept comments on this Notice through October 30, 2010. Science Advisory Board Staff Office Request for Nominations of Experts for the Consultation on Revisions to the Multi-Agency Radiation Survey and Site Investigation Manual. [FRL–9216–4] . SUMMARY: The EPA Science Advisory Board (SAB) Staff Office is requesting public nominations for technical experts to augment the SAB’s Radiation Advisory Committee (RAC) to conduct a consultation on revision to the Multi- Agency Radiation Survey and Site Investigation Manual. DATES: Nominations should be submitted by November 12, 2010 per instructions below.